Get smooth up-and-down action on your table leaves. This works very well with the drop leaf supports. Used on a drop leaf of 2" butcher block on top of a kitchen island. 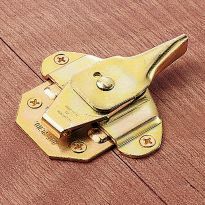 The hinges were just what I needed and came with the exact screws that almost impossible to find at the big box stores. The hinges were easy to install and work perfectly. I would recommend these hinges to anyone who is looking for hinges for a straight edge fit on a drop leaf. 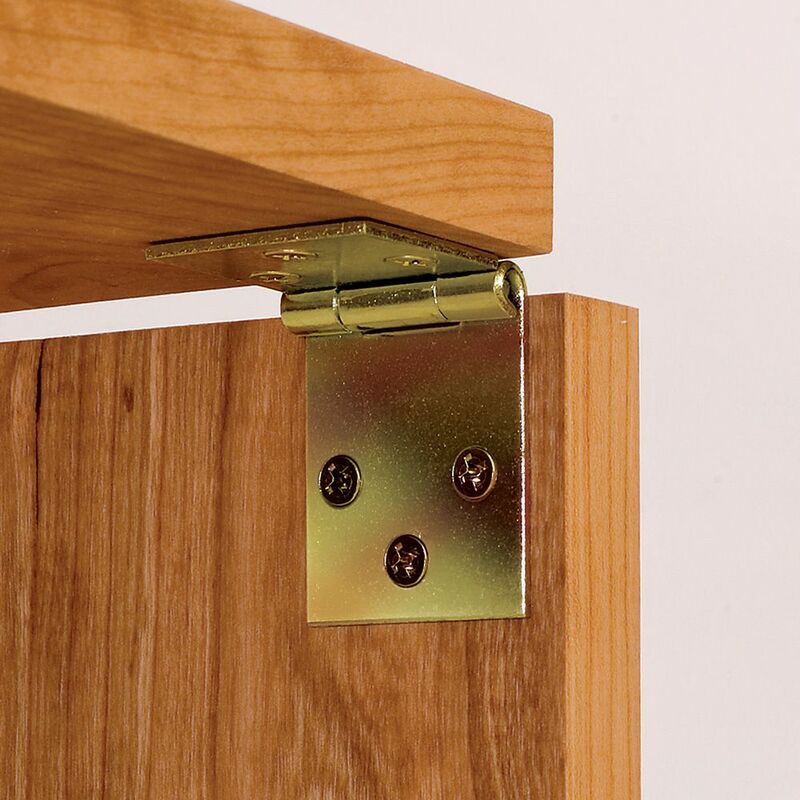 I used these hinges on a maple drop leaf table I was building and they were excellent. They were very strong and when the leaf is up it was sturdy and you could hardly see the seam!,,,Thank you Rockler!! Good quality - nice and flat and don't require reworking. Brass plating and c'sink holes well done. The hinges were excellent. Seated well, worked smoothly. Included screws were convenient. The shaped edge version requires that you rout a groove for the hinge barrel. It would have been helpful if sizes and instructions for this were included with the product. Nonetheless, an excellent product. Used on a kitchen table to fit our apartment. I used these hinges for a Handkerchief table. 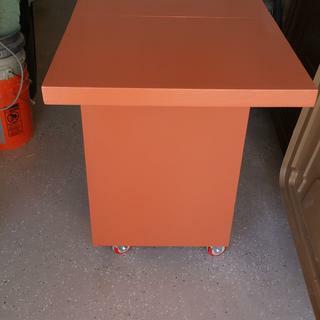 It is a square table that one side folds down and makes it a triangle. Great for in corners. The hinges worked very well. Used them for a drop table for a computer on my boat. The hinges work very well. They are smooth and solid. Glad to see they came with screws. I'll be back for more products from Rockler! After trying several other vendors and websites, I finally found these hinges at Rockler. They were exactly what I was looking for the drop leaf table that I was building. Good quality and Rockler's service is excellent. Good value, eases to install. Worked great everything went as planned(almost)I got brass plated. 1 set looked great the other set looked like it was bronze. Hinges were as advertised. Good finish with a hefty weight more than suited to the demands of my project. Speedy delivery. Nice looking hinges. Worked real well. The screws provided are low quality. The hinges got the job done. Hinges were good, spec'd in a magazine for drop leaf table. Hinge barrels are sloppy, not a good fit. Screws are very poor...broke 5 trying to seat them in a maple top...even with pilot holes. Had to change to better quality screws. 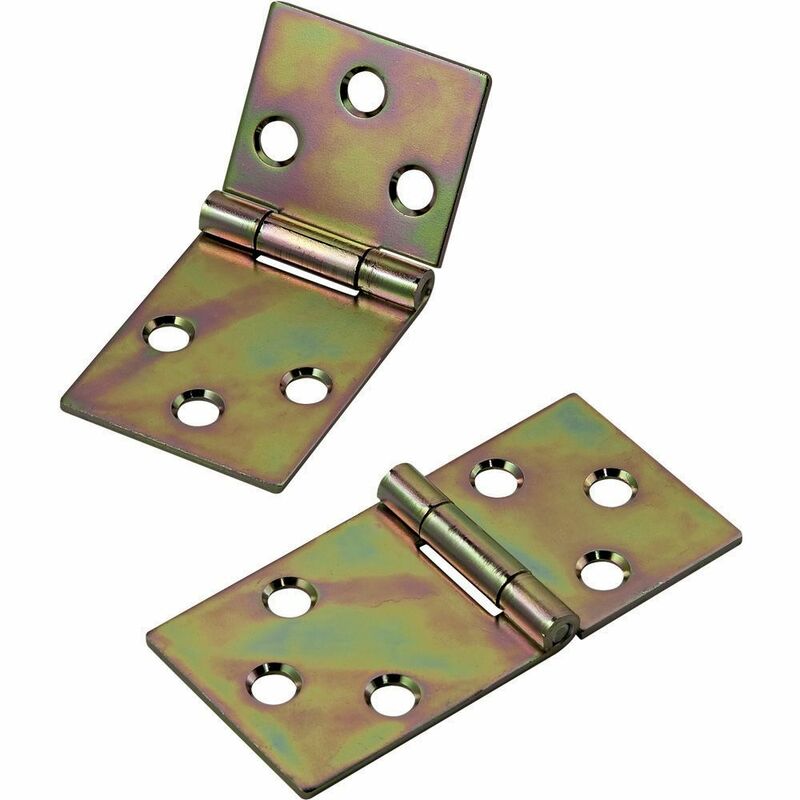 I bought the brass plated hinges because the plain ones were on extended backorder. They are probably more visible from the outside with the leaf down then the plain metal ones would be. Another minor irritation was 1 of 3 sets was short a screw in the bag. Otherwise the hinges work well. The counter sink holes were on the wrong side of the hinge. My woodworking project was due a few days after I received the hinges so I wasn't able to return them. While I got them to work, the hinges are poorly made out of stamped steel. They were loose on their pins and, in one pair, one hinge was completely out of alignment. application - needed hammering in a vise to get it straight. Next time I will buy more expensive and better-made hinges. This hinge does work as described. The poor quality cannot be fit in the intendedapplication manner. 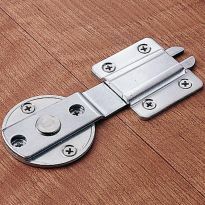 The hinge doesn't bend complete 90 degrees and has the center of rotation placed incorrectly. Alas a completely useless product.Editor's note: When selecting hinges please note Application A is shown on the left for straight edges and Application B is shown on the right for a rule joint (curved edge/concave & convex. 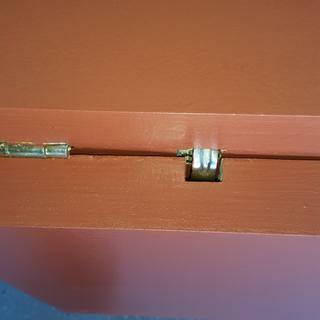 The pin placement will be different between the two styles and hinges will not be able to be reversed to use in the other style of application. Ideally suited for my application. it fit my table - I think! I needed them for the pontoon boat table I'm making. I also wanted the free freight. Used them before. Good quality. 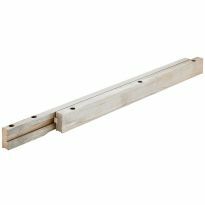 For a drop leaf that will attach to the edge of a cabinet. I am building sewing tables that have a drop leaf at the back. Pull the table away from the wall and raise the leaf. This provides ample room for longer fabrics, and prohibits anyone from setting items on the back of the sewing table. This particular hinge us specifically to hold a drop leaf. good fit for the project. Good pictures and description made it clear these were the correct hinges for my project. Reviews noted high quality and thoughtful design. Using 4 hinges on kitchen table that I'm turning into a craft table with a drop leaf. Use for a sewing cabinet. 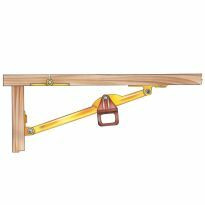 They came up on the web page as a suggestion, when I looked at drop leaf table supports. rockler stores is discontinued. no choice but to get online. Normally, I would just use one of the hinges I have in my hardware drawers, but this one appears to be exactly what I need for a successful job completion. 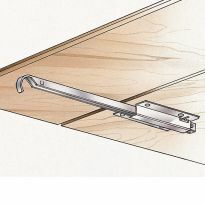 Hinge plates look simple to install and necessary for my drop leaf butcher block island countertop. I am repairing a drop leaf table and some of the hinges are missing.. I intend to use these hinges on a drop leaf butcher block countertop with the leaf being 56 inches long. Is two hinges enough or should I install four? BEST ANSWER: How wide and thick is this leaf? 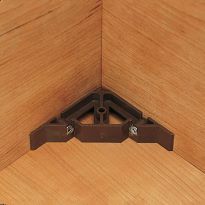 A typical butcher block counter top of 1 1/2" thickness and of any significant width is possibly beyond the capabilities of any number of these hinges. At minimum I would consider five hinges (about 11" apart) with extra long screws into both sides of the hinge. Thank you, you confirmed my thinking of about using 4 hinges. MInimum of 3 for such a large table is what I would recommend. Thank you, I was leaning to installing 4 for that reason. Thanks for confirming what I was thinking. Thank you for taking the time to answer my questions which confirms which way I was leaning. What is the difference in length the long side vs the short side not the overall length, but the length of each side as the pivot point being the center? BEST ANSWER: Long side goes on leaf so screws are beyond any curved edge. The long side is one-half inch longer than the short side. With the straight edge hinge, is there a gap when the leaf is up? Or is it flush with the table? I really don't want a gap so I may need to purchase the other hinge. BEST ANSWER: No there should not be a gap with these hinges. You can also use a drop leaf edge to have a better joint when up. I do not have a gap. 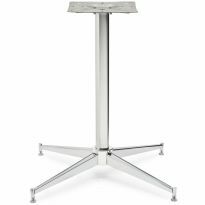 The drop leaf fits flush with the top of the table. Could I please ask what is the thickness of the material the hinge is made of? I presume that the material is steel (with zink on surface)?